No other plugin has the comprehensive ability to manipulate pitch and time like Fault. 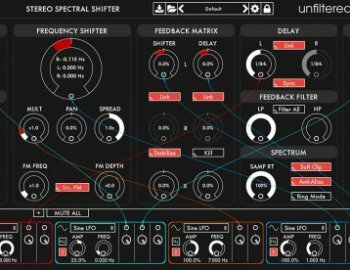 Whether used at mixdown to fortify weak tracks or in sound design to totally mangle instruments beyond recognition, Fault's applications are limited only by your imagination. With over 100 factory presets included – featuring settings from contributing artists like Richard Devine and Scott Kirkland from The Crystal Method – finding creative inspiration with Fault is fun and engaging. Three main processors power Fault's comprehensive spectral control. Dual-channel Pitch Shifters musically retune sounds up or down as much as a full octave, in steps as small as 0.1 semitone. The stereo Frequency Shifter can be modulated by precision FM controls to create beautiful and discordant sounds alike. Stereo Delays use cross-channel feedback and filters to add immersive depth. And if that weren't enough, every control knob and switch setting can be itself controlled dynamically by up to eight powerful and flexible modulators, two of which are brand new in version 1.1: Step Sequencer, and ROLI Lightpad (for seamless integration with ROLI’s latest MIDI controller hardware).